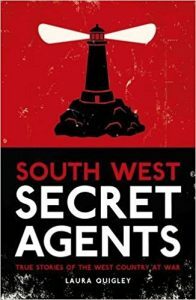 Have just finished Laura Quigley’s highly readable South West Secret Agents: True Stories of the West Country at War. She weaves captivating threads of daring deeds that includes; “rescue operations as the exodus from France began, to the secret guerrilla army in Devon and Cornwall, this book will amaze and intrigue with the incredible stories of Jasper Lawn of N51, the Helford Flotilla and the first escape routes for POWs, agents and crashed airmen”. Laura will be talking on the subject at Spurgeon Hall, Mutley Baptist Church, Mutley Plain, Plymouth PL4 6LB, on 24th April, 2018, 7:30pm. Free entry, donations welcome.